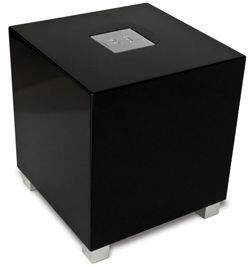 BRISTOL SHOW 2012: REL unveils its smallest ever subwoofer – video report | What Hi-Fi? REL has made a name for itself with a range of beefy subwoofers, but here at Bristol it's taken the wraps off its smallest model to date. The dinky T-Zero weighs in at 6.8kg, measures 24.1x21.6x26cm and yet still packs a powerful 100W Class D amplifier. It's a sealed-box design, and underneath there's a 6.5in downward firing long-throw driver. The cabinet is made from thick, bonded slabs of MDF for maximum rigidity, and finished in gloss black or white. There's a Neutrik Speakon high-level input for direct connection to an amplifier, and RCA low-level input with separate volume control. A panel on the rear houses controls for gain control and phase reversal, and the T-Zero will handle frequencies down to 38Hz. It's available now for £350. Watch our video report here.